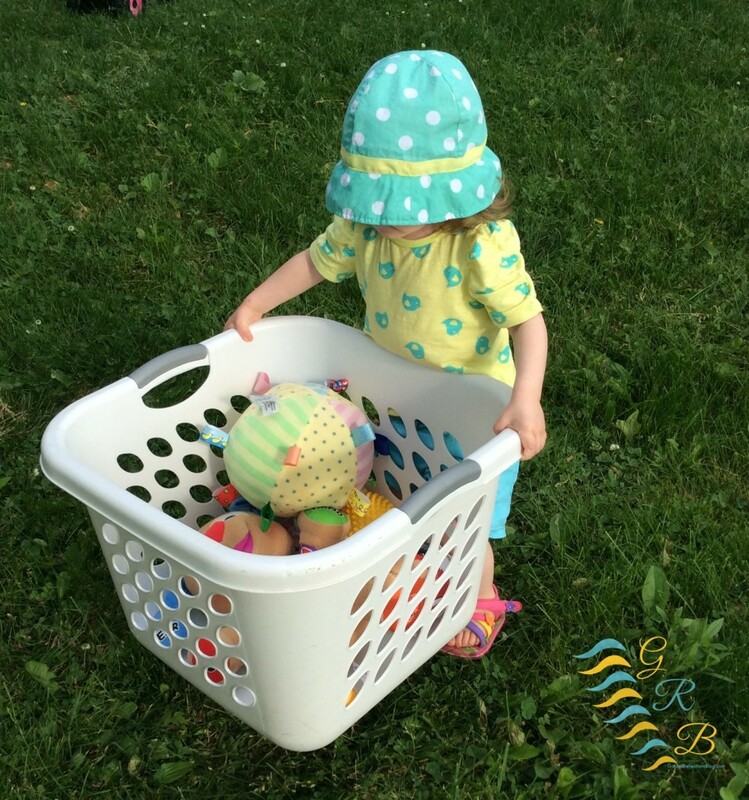 I am excited to be participating in the Sensory Processing Play blog hop again today! 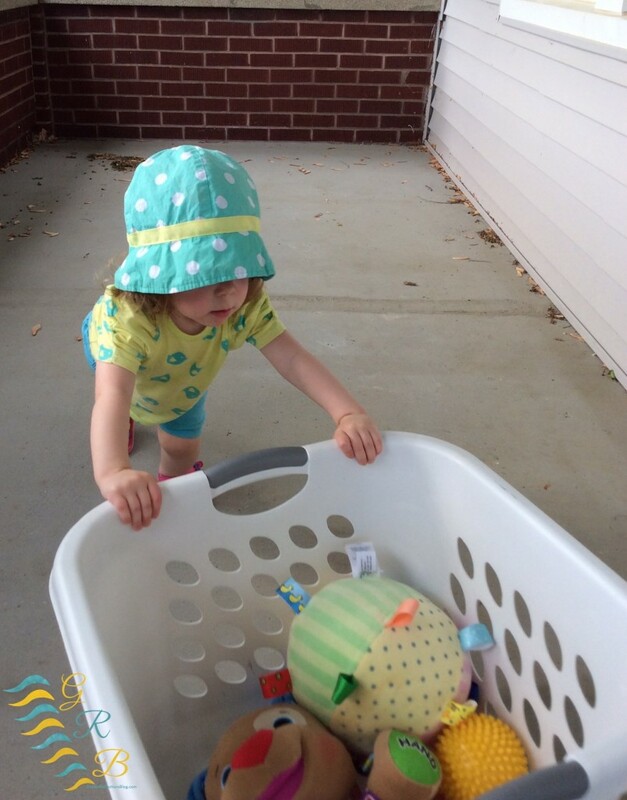 I am sharing a really easy laundry basket push game, a perfect proprioception activity for your toddlers or kids of any age! This activity is super easy to set up. Simply place a couple heavier size books into the bottom of the laundry basket. Then have your child pick out some of their favorite toys into the basket. I started by placing the basket out in the yard. I knew my daughter loved pushing objects like this around because she had done so before with boxes and other larger items. However, the grass was not the best to push the laundry basket on. 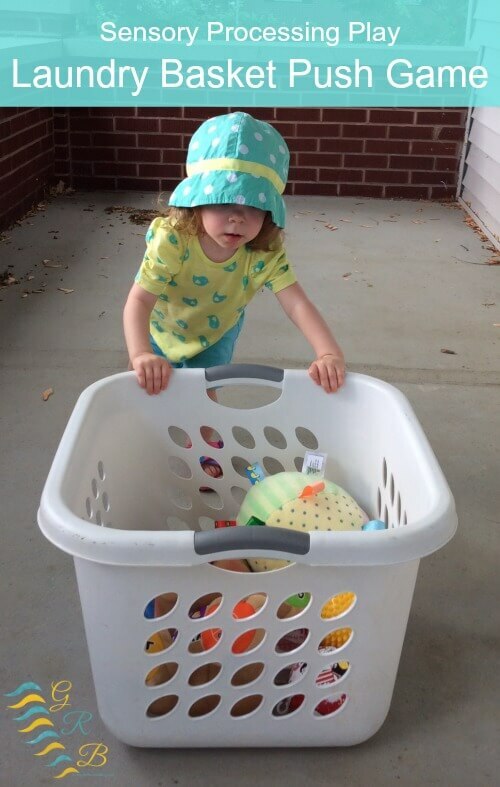 She did pick up the basket a few times and carried it some around the yard. This is still a really good heavy work and proprioception activity. So I moved it up to the front porch, which was much easier for her to push around. She ended up pushing this around the front porch for about 15-30 minutes! Here is a short video I took of her pushing it around the porch. You can see in the video how much concentration she put into this activity! That is when you can tell an activity is really working. By taking an activity that your child is showing an interest in and adding just a bit of a challenge to it, they will want to keep doing it until they master it! In my daughter's case, that was taking her love of pushing empty boxes or carrying boxes around house and providing her a “just right” challenge by adding some weight and making it fun! Make an obstacle course with the colored floor circles or cones and have your child push the basket while weaving in and out of the spots or cones. Make lines on the floor with the tape, either straight, zig-zags, a figure 8 design, etc. and have them push the laundry basket following the tape. This is a great way to add in some extra visual motor skills. 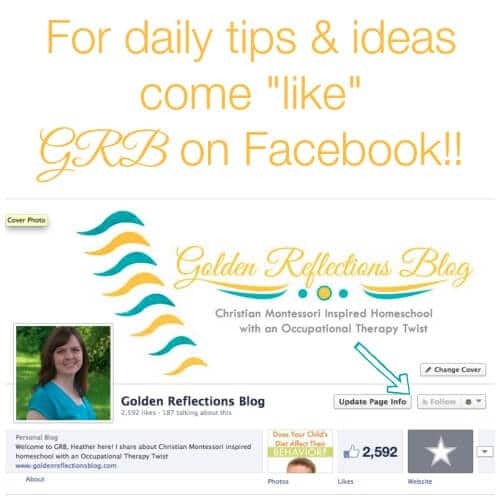 Follow Heather @ Golden Reflections Blog's board Vestibular & Proprioceptive Activities on Pinterest. I also share lots of ideas every day on my Facebook Page! 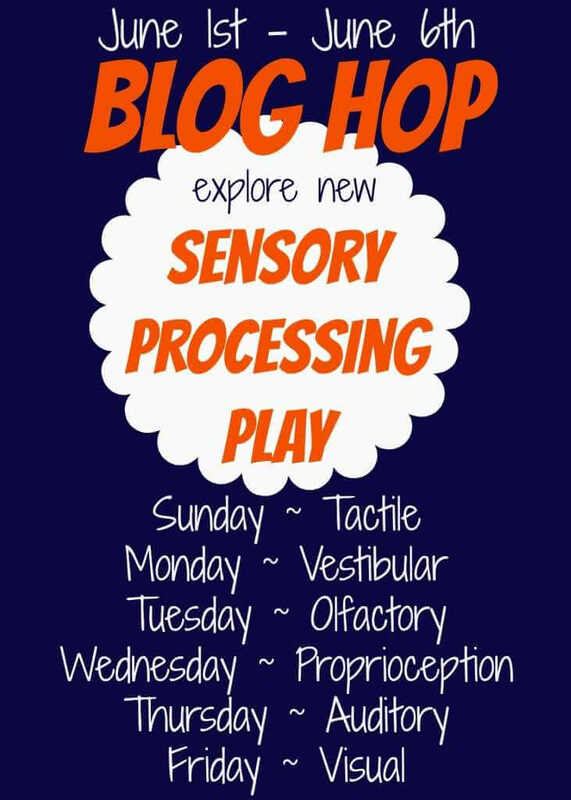 Be sure to check out all the other Proprioception activities shared today in the Sensory Processing Play Blog Hop!